Medal of Honor: Allied Assault contains the original MOH and the two expansion packs, Spearhead and Breakthrough. MOH was first released in 2002. There is a Linux installer, released by Iculus, for the game, but it is for the original version and is a beta release. The libraries it needs are not available in a modern Linux. There is a standalone Linux binary available here. To use it, install the game on a Windows computer, patch it up to the latest level. Copy the installed game to a Linux computer. Unpack this downloaded archive in the root of the MOH directory. Run the game with ./mohaa_lnx. An attempt to use Crossover to install the game failed as it was not possible to switch to the second DVD disc. There is a possible solution to this by creating a single DVD installation disk for MOH:AA. This process is described here. 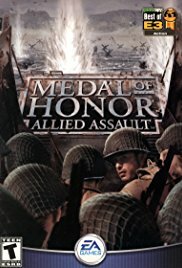 Better yet would be to create a single DVD that would encompass the original MOH:AA along with the two expansion packs. That process is described here. When creating a custom DVD, you can add any additional files you may need, such as updates, mods and textures. At the moment, Codeweavers Crossover can install the game, from the original CD version, the DVD version and the homemade all-in-one DVD version, BUT THE GAME WILL NOT RUN. I'll check out POL and see how that does.